John in his always playful spirit, while assessing plants in the Terezayi District Center on February 19th, 2011. 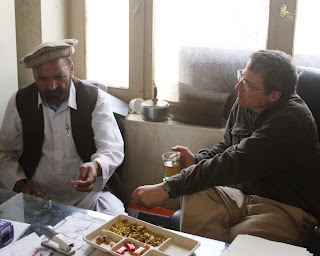 This past February in my Rolling Out the Red Carpet post, I mentioned a gentleman named John Harrington who came to work with our team through his work with the Afghan Water Agriculture and Technology Transfer (AWATT) program. I'm not certain exactly how long it took to read the few sentences contained in that email, but I will say that it felt like time stood still as my entire body started to absorb the news I feared most. Tragically, while riding his bicycle home from work on Monday afternoon, John Harrington was killed in an accident. In the email, sent from his wife whom I've never met, she explains "He was biking home from work and was in the wrong place at the wrong time and was hit by a car. " ﻿﻿John first visited our team in late January, just several days after I departed FOB Salerno for my short trip back to the States. During his time here with the 3-19th ADT, John literally wrote the book on our forestry initiatives. As no organic member of our team had any background in forestry, John's wealth of knowledge was welcomed with gracious arms. ﻿﻿As I returned in mid-February, I have to say I was shocked by the extremely kind words so many members of our team used to describe John. I guess you could say that I was guilty of judging a book by it's cover when I first saw John's picture (wearing a flannel shirt, propped up against a giant tree with one hand on his dog) attached to his bio and curriculum vitae. Civilians working in development often get a bad reputation (many deserve it) but John was quite the exception. 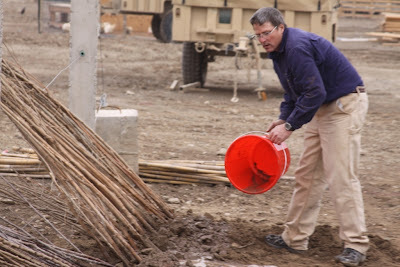 While working in Afghanistan with the AWATT program, John was officially based out of Kabul. Always the adventurer, he loved to marvel us with stories of he and other friends escaping the confines of their government compounds to sneak out on "freedom-runs" around the city. ﻿﻿John made a second trip to FOB Salerno on February 16th; it was during this visit that I was finally able to meet the man so many had raved about. Within minutes, I immediately understood why so many were attracted to his outgoing, magnetic personality. In many cases, "PhD" would better stand for "Pile it Higher and Deeper", but this could not be father than the truth for John. 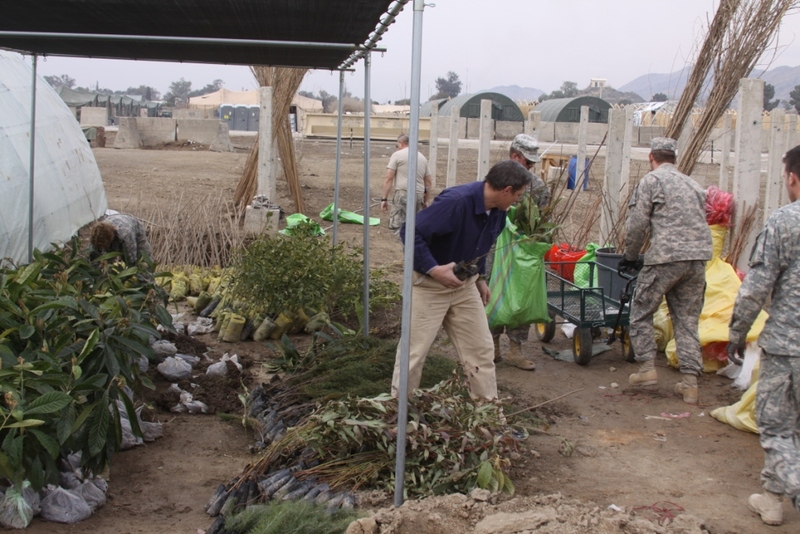 Under John's guidance that third week of February, we received our first shipment of trees. If I recall correctly; 4,000 trees in total made the journey onto the 3-19th ADT's demonstration farm from their original nursery in Jalabad. Captain Randy Cuyler, the annoited "Tree-Man" for our team, had a chance to really get to know John as they worked hand-in-hand to outline our programs. Randy and his wife had actually been planning a trip to visit with John in his northern New Mexico home this fall. I guess you could kind of compare the process of "getting to know" somebody here on FOB Salerno to speed dating. With considerably few other distractions, you really can get to know a person quite well in just a few short days. Before we'd even finished lunch on John's first day here, he and I had already established our common bond- running. ﻿﻿John was what many might refer to as a freak of nature, an ultra-marathoner. Within days of returning back to the States this spring, John participated in the Bataan Memorial Death March Marathon. Of the countless stories he told, one in particular comes to mind when I think of his extraordinary endurance. Supposedly, while undergoing a stress test during a routine doctor's physical, John was instructed to climb aboard a treadmill. John claimed he had told his doctor of his dedicated cardio routine, but apparently nobody had ever seen the treadmill maxed out on both speed and elevation- twenty minutes into the test, with such little increase in heart rate. By the time John finished the test (his doctor pulled the plug), seven cardiologists had gathered in the testing room to sneak a peak at this phenomenon. 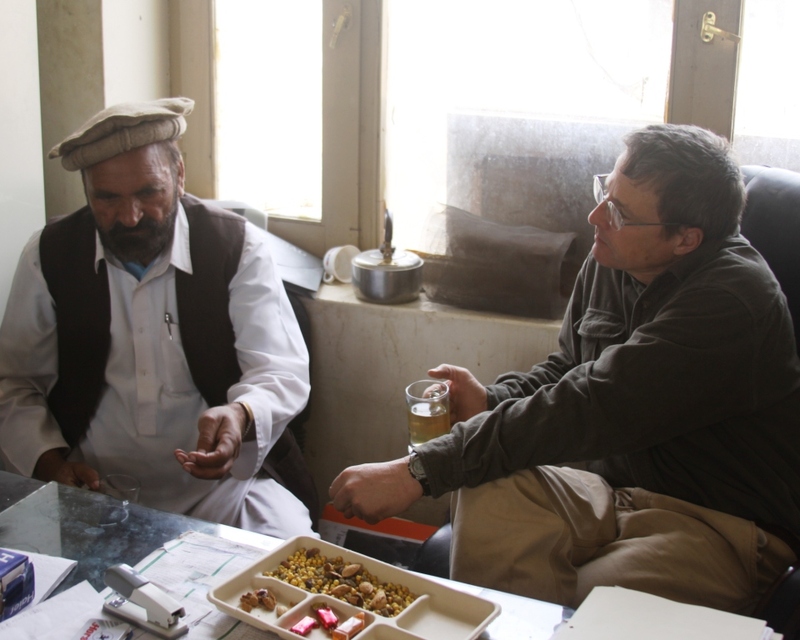 Several months after John's departure from Afghanistan, he continued to keep in touch with members of our team. John was actually in the process of assisting one of our interpreters, Nick, gain acceptance into graduate school at New Mexico State University- where John served as Superintendent of the Mora Research Center for the school's forestry department. After learning that another team from Indiana would be replacing us this coming fall, John volunteered his services to meet them at Camp Atterbury in an effort to prepare them for Afghan reforestation. John truly enjoyed helping others, free of charge, for the good of the cause. Doc Harrington had a gift for sharing his talents with others, and he found a way to make his instruction interesting- the mark of a true educator. 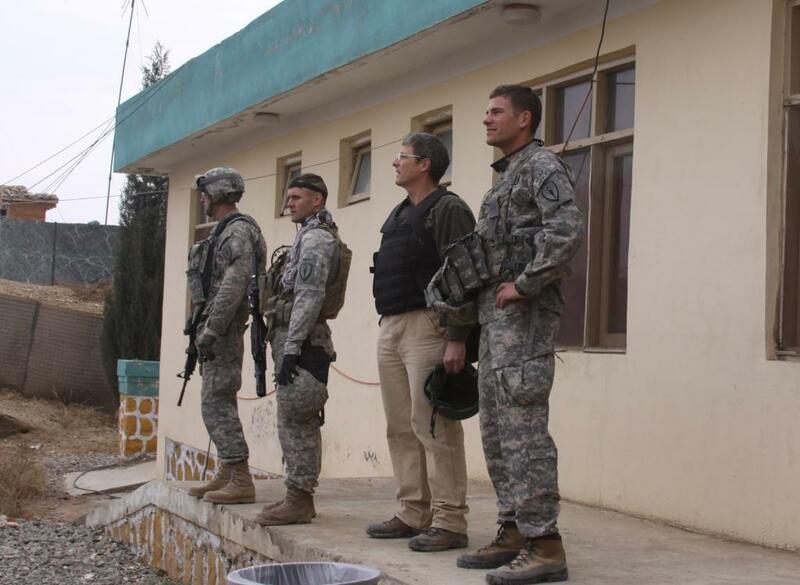 John genuinely cared about the safety of each and every soldier here in Afghanistan. Each time we'd correspond, he'd sign off with a "please take care of yourself and the others, I am counting on you." He'd do the same in emails with other team members as well, each time he wrote our safety was his number one concern. In my most recent email exchange with John, I inquired about his willingness to be a part of a running team in the "Bourbon Chase Trail Run". After learning the details of this 200 mile, overnight adventure through the Kentucky Bourbon Trail, John was more than willing to fill one of the twelve required runners positions. While John obviously won't be filling one of those twelve positions, rest assured that a team will still be assembled in his honor. It is through John that I've learned the greatest takeaway from distance running- the people you surround yourself with. John constantly encouraged younger runners to "slow down and enjoy their surroundings" and on many occasions was known to ruin his own pace in an effort to ensure a new runner might finish a race for the first time. Ag Extension Agent Haji Mohammed on Feb 19th. It seems quite paradoxical that after running through the streets of Kabul, training in the outskirts of Mazar-e-Sharif without the first trace of security, and finally traversing the hills of Khowst Province here with the ADT; John would ultimately be called home while doing what he loved- biking through the tranquil mountains of northern New Mexico. John will be dearly missed by so many across the world, his work has literally spanned several continents. Future generations of Afghan people will reap the benefits of his work for decades to come, as will countless students and an equally impressive number of runners. We on the 3-19th ADT would just like to thank John's family for sharing him with us over the last several months, it has been an honor to work with such a true gentleman. The world is truly a better place because of the work that John Harrington accomplished during his short 49 years here. Up until this point, we have been extremely blessed with a safe mission. I never would have imagined that our first loss of a teammate would occur back in the States. In many cultures it is appropriate to plant a tree in memoriam for the deceased. What do you do for a man who has built forests? John doing what he did best- educating. Here we are looking at the barren hills of the Terezayi District. Wow, this was very touching! It sounds like you were blessed to have time with this great man in his short, but fulfilling time here on Earth. I want to express my heartfelt sympathies again, Bart. I hope you're finding some comfort in the cherished memories you have. An amazing man and an amazing story you have written to capture a part of his life. I am saddened by your loss and without even knowing him or ever meeting him, I too mourn the loss of such a great human-being. Thank you for sharing with us! A very nice tribute, Bart. I'm sorry for the loss felt by you, his family, and his friends. Many of us hope to have some impact on the world we pass through to leave things a bit better for those who carry on after we depart. John seems to have done just that. Thank you all for the kind words. John's widow recently emailed, as you might imagine she has been overwhelmed at the countless number of people telling similar stories to mine. 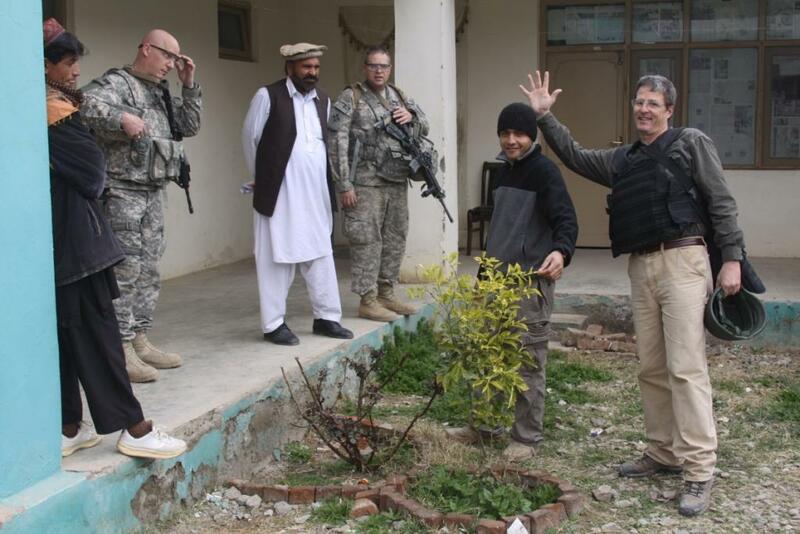 Lee, if you wouldn't mind- I'd love to contact you in an effort to follow up with an admissions issue at NMSU we are dealing with for one of our Afghan Cultural Advisors. Please email me bartlomont@gmail.com when you have a free moment. Thank you for such a touching tribute. I hadn't seen John since before he went to work with your team, and was unable to see him when he visited my family just after his return and to hear about his travels. This was lovely, if difficult to read without crying. I knew John as a long time customer and a friend. He was always so ease to talk to. Thank you for this wonderful Tribute.